Roche, DSV & Sie is an architectural office set up in 1989 and led by the French architects François Roche, Stéphanie Lavaux and Jean Navarro. The organic, oppositional architectural projects of their practice is concerned with the bond between building, context and human relations. 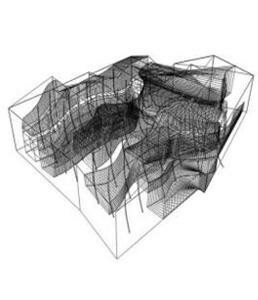 Roche explains his concept of ‘’spoiled climate’’ chameleon architecture, which links and hybridizes the human body to the body of architecture by a rescripting of the rules of the nature of each situation. Roche, DSV & Sie consider architectural identity as an unstable concept, defined through temporary forms in which the vegetal and biological become a dynamic element. The project for a new cultural centre on the docks in Venice, as an extension of the School of Architecture, is their way of describing their research into a critical experience of architecture through a mutation of contextual parameters. Experimental and inventive, the architecture of Roche, DSV & Sie plays with a PVC membrane, developing a multitude of different layers and making a scenario of hybridization, grafting, cloning and morphing. There is poetry in the meeting of body and space. They hope to achieve that have the users feel a sense of belongingness with their surroundings. It is a matter of listening and observing.